Isn't kindergarten the best? The excitement, wonder, innocence, questions, energy, and the love! The first day of school encompasses all of those amazing things about kindergarten BUT it can also be emotional, stressful, and crazy! 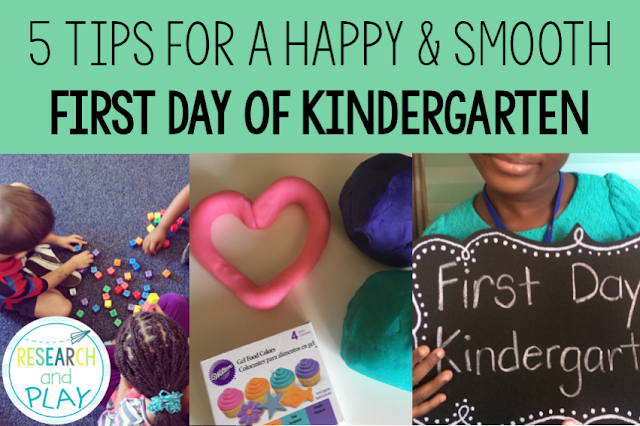 After 6 "First Days of K," I've learned a few things that I want to share with you all to help the first day be happy, smooth, and fun! 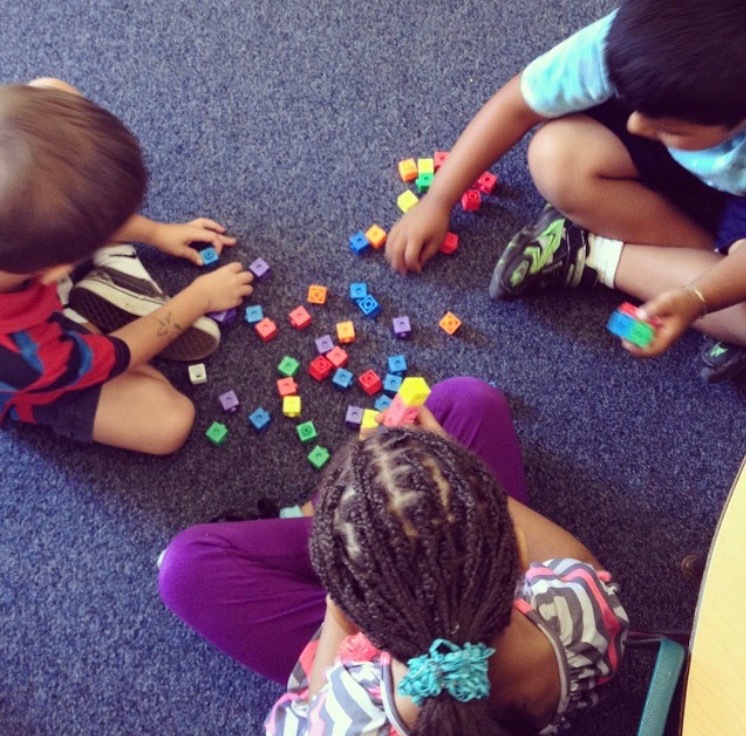 Get cubes for each table and let them play! I created math toolboxes for each table that include both cubes and pattern blocks. You can make these using Sterilite tubs (I got these for $.97 each). 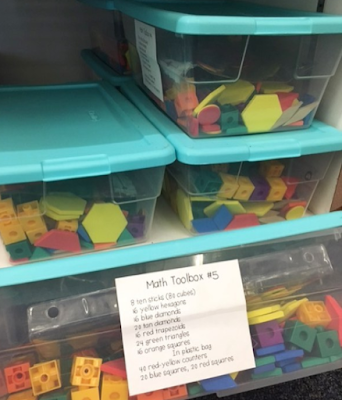 You can also slowly introduce the materials by just including cubes at first, then adding pattern blocks or other math manipulatives that you'll be using a lot during the school year. Yes, they'll build towers with the cubes. They might even make lightsabers or guns, but this would be a great learning opportunity to teach about appropriate uses for the cubes! Not only will you get the chance to introduce materials and give expectations for them but you'll also hear lots of laughs and conversation and see happy students all around! Kindergartners love to build! Get out the playdoh! Now this isn't for the faint of heart, but the earlier you introduce it, the earlier your students learn the expectations! You can bet that the second the playdoh comes out, you've got your students' attention for a good 15 minutes. Again, this is a great time to talk about expectations for how to use playdoh. In my classroom, we use playdoh on a daily basis so teaching expectations early on is crucial. 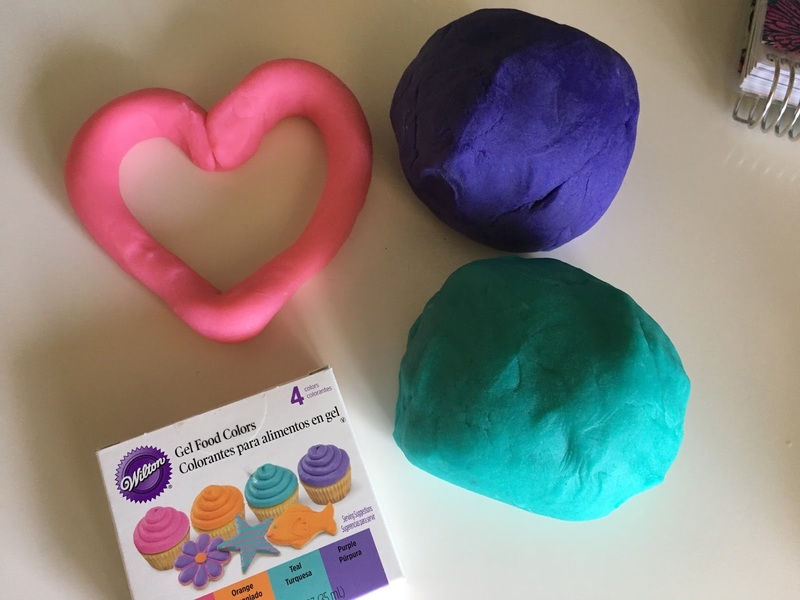 You'll be going through lots of playdoh if you use it as often as we do, so learn how to make your own! I did, and it was SO EASY AND CHEAP! Click HERE to read how I did it! A note on coloring: You may think this filler is a good one, and for some students it is! However, don't count on coloring to be a tried and true activity. I definitely plan for coloring activities, but I use them sparingly. I've had students in the past who do not yet have the fine motor skills for prolonged coloring, or they do not yet have the attention or task management to complete a coloring activity and will scribble it for about 30 seconds and say they're done. And that's totally ok! They will develop those skills as the year progresses, but coloring shouldn't be a way to fill time at the very beginning of the year. Watch your students and see who needs support and who enjoys it. Then work on coloring later on! If you'd like a quick coloring activity, though, click on the picture below to download this FREEBIE. Class roster + page protector + dry erase marker = lots of crossing off. I have this starting on Day 1 and use it all year long! When your students transition from the rug to their tables, cross them off. When someone goes to the bathroom, cross them off. As they're playing in centers or reading around the room, cross them off. It will save your sanity! Do things as a group. This might mean taking whole-class bathroom breaks those first few days. As students are sitting in the hall waiting for their turn to go in, you can play Simon Says or quiet mouse, still mouse. You can also do things as small groups. Have table groups? Let the entire table group get up and go to the bathroom or transition to recess together. This helps because you know that each table group has 4 students, so you're always mentally keeping check of groups of 4. If there's a group of 3, you know you need to do some looking! If someone gets "lost," don't panic! It has happened to all of us (who teach K). Make sure your front office staff knows this, too, so that they are aware and alert in case they see a traveler from your class. One year, I don't know how I would've made it without my front office staff. I had two travelers and one who would refuse to leave the room at transition times. Even though I had an aide, I still wasn't able to be everywhere I needed to be! Our office staff was always there to help find a child who was exploring campus or to stay with a child who wasn't ready to transition. A buddy teacher who doesn't have a class all the time (reading specialist, literacy coach, librarian, etc.) could also be on your support team! Make sure you talk to those students' parents about their transitioning issues. You need parent support to help those students get safely from point A to point B. Make a plan and reward students who transition successfully. 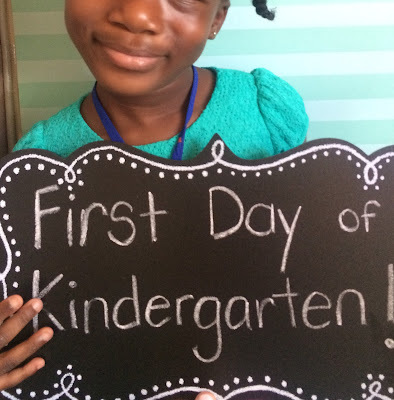 Make it a big deal because in kindergarten, it is! Now this one isn't a shocker, but you're probably thinking, "Stay?? Are you serious?? For how long?? Won't it make the kids more sad??" Yes I'm serious, for only 15 minutes, and if your student is already sad, letting their parent stay for a few more cuddles isn't going to make them any more or less sad. If you teach kindergarten, you know that most of your students will come into your classroom on the first day with smiles and excitement. A few students will be quiet and sad, and some may even cry. Transitioning away from their parents, some for the first time if they didn't attend preschool, won't be easy! However, you may also know that this transition is ALMOST ALWAYS harder for the parents than their children! So give the families a few extra moments together. If you have sad students who are upset when their parents leave, and you will, make sure you talk about it! What a wonderful time to start talking about empathy with your students. You can discuss how he or she feels and why. Your students will even offer up tips for that student to feel better! Have a stuffed animal or cuddle buddy nearby for these students. Allow them a few extra minutes before joining in. Let them hold the buddy all day if they need to! This is a big experience for a child, help them feel as comfortable as possible! This may seem impossible! You already know you have short attention spans that will make you adjust your plans all day long, and now you see that you may have some traveling students who like to explore campus on their own terms, and now I'm asking you to stop and take pictures?! Trust me, you can! You will regret not having that "First Day of K" shot at the end of the year when you're putting together their memory books. Have a prop, or don't! I found a cute chalkboard at Hobby Lobby last summer along with a poster board that I loved. I hung the poster on one of my cork boards and had each student come over and hold the chalkboard sign. It took about 15 seconds per child. A lifesaver during picture time? Put on a read aloud on Storyline Online. This website is amazing, do you use it? Lots of great titles are read aloud by various actors! There are stories that are about 4 minutes long and some that are 12 minutes. Plan accordingly! Also, take pictures of routines. When your class lines up successfully, take a picture! When they transition to their tables, take a picture. As they're sitting on the rug for whole group time, snap a pic! Show your students these pictures over the next couple of weeks as you continue to discuss routines and procedures. They'll be able to see themselves in action (win) and also make improvements as they continue to learn (double win)! 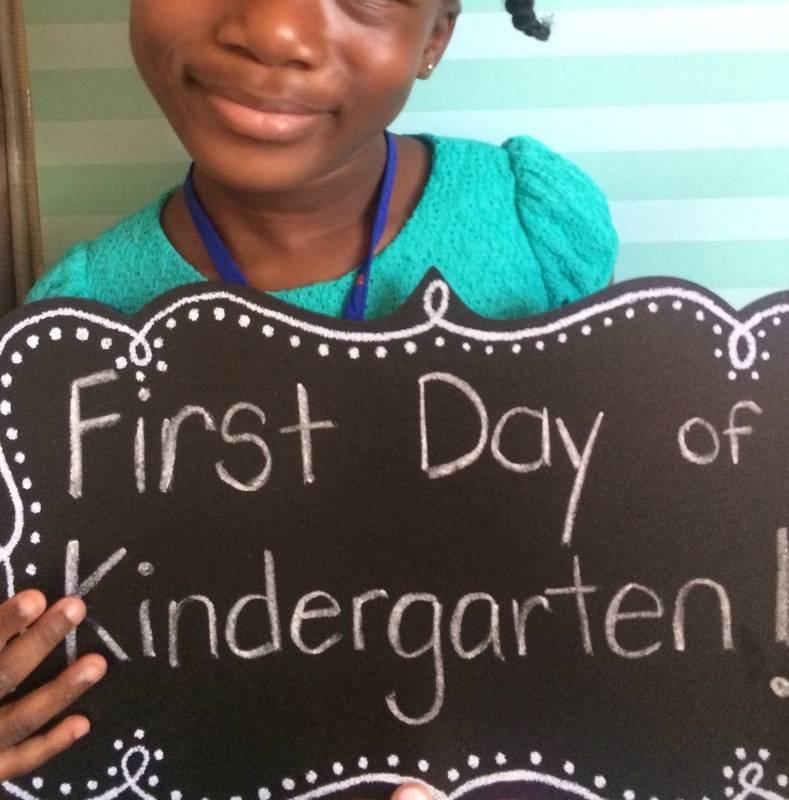 Congrats, you made it through your first day of K! They've managed to pack up all of their belongings (hopefully they grabbed the correct belongings) and you're ready to head home. The students are excited, but you're terrified. What if you let them go with the wrong adult? What if there's a custody issue you're unaware of? What if a student just takes of on his own because "he just lives down the street"? 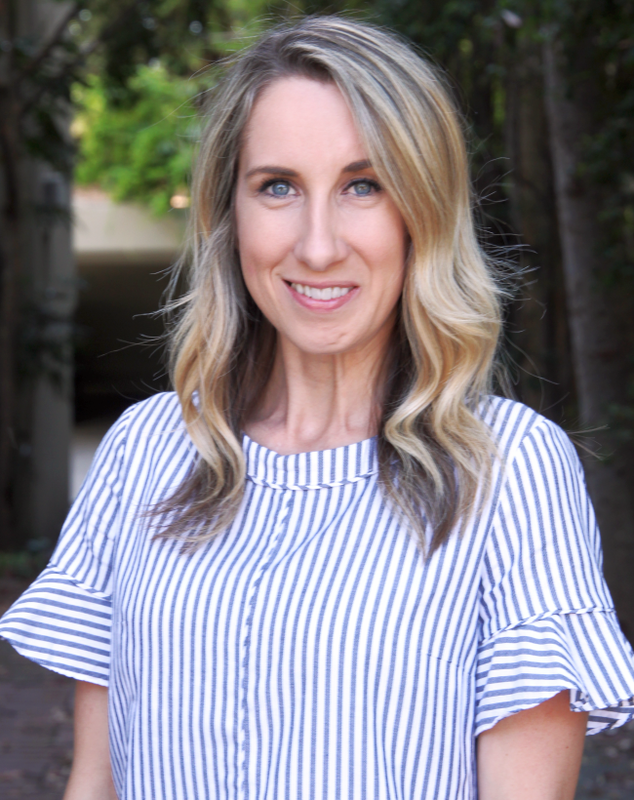 While parents are in the room in the morning, or if you get to meet families at a pre-first day event, make them write down exactly who will be picking up their child on the first day and who will pick up on a regular basis. If it is a parent you've already met, great. Try your best to remember their face! If it's an adult you haven't met, don't feel bad asking for ID when they come. Make sure parents write the name of the person, not just "Grandma." Pretty sure Grandma's ID won't say Grandma on it. Click on the picture below to download a simple form for parents to fill out. If you're at a school where bus riders go to one location and walkers/car riders go to another, then they each wait for their ride/bus, here is your quick tip: Buy adhesive wrist bands (like the ones you'd get at a carnival or event), and write each child's name and way home on it. Then, attach the wristband to the loop of their backpack. If they don't have a backpack, then attach it to their wrist! If you put it on their backpack, you can communicate to parents not to remove it at least for the first week or so. 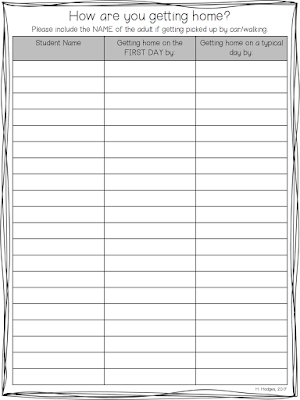 Get the pick-up list that your parents' made for you and stick it in a page protector along with a class roster. Grab a dry erase marker. Have a spot already picked out that students can wait that is AWAY from where the parents stand. Make sure you have a routine PLANNED OUT. In my class, my students are told to wait on the steps until I call their name. If they see their grown up, they get up and go to them. I watch, make sure I recognize the adult, and then cross them off my list. This goes slooooow the first few days of school, but make sure you communicate to parents that this is to keep their children safe so you know they are going home with a safe, designated adult. Eventually, we move from this one-at-a-time routine to the students exiting, going to the steps, and when they see their adult they come over and tell me goodbye. This way, I can look, see their adult also, then cross their name off. If they do not see their adult, they stay on the steps. 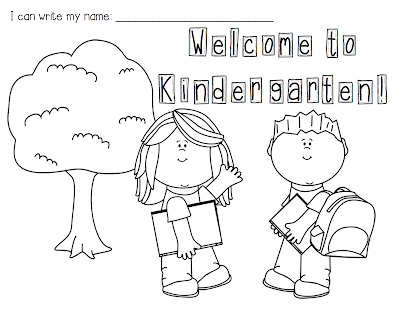 I hope these tips help your first day of kindergarten be a happy and smooth one! Now get home, pour a glass of wine, and go to sleep by 7 pm. Have a wonderful school year! Great tips! Love the adhesive wristband idea!!! Ordering some now :).